CHICAGO -- Forget about Marvin Bagley III and the rest of Duke's talented freshmen for a moment. 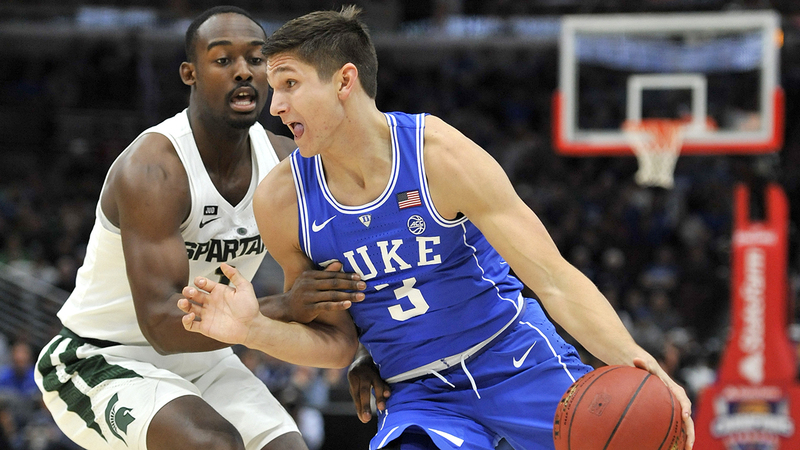 On a court full of some of college basketball's brightest stars, Allen - Duke's only senior who was joined by four freshmen in the starting lineup - stepped up whenever his team needed a big play. The Blue Devils (3-0) lost Bagley to a right eye injury midway through the first half, but Allen made five 3-pointers and scored 23 points in the second half to help make up for the missing phenom. "I've played in 90 more games than the four teammates that are out there with me," Allen said. "I feel a little more comfortable and calm and confident out there. Watching a lot of film of me my last two years, it's good sometimes to go 100 mph, but it's also good to slow it down a few times, so that's the adjustment I've tried to make and I think it makes me more comfortable out there." 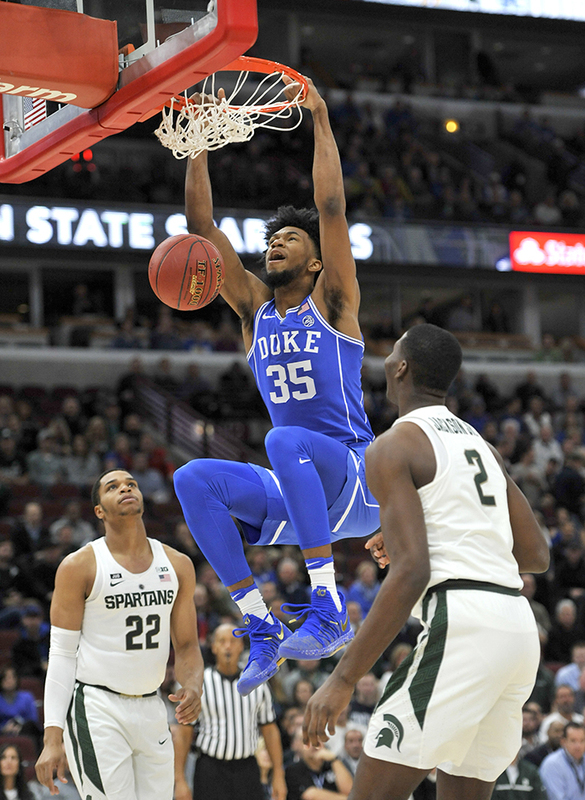 Duke's Marvin Bagley III dunks between Michigan State's Miles Bridges (22) and Jaren Jackson Jr. on Tuesday in Chicago. "It's not a thing. You don't get any banners for a record against one school or against another coach," Krzyzewski said, brushing away any talk about his record against the Spartans. "Our program is about winning against everybody if we can." Miles Bridges, Jaren Jackson Jr. and Nick Ward each scored 19 points for Michigan State, which blocked 12 shots - just one shy of the school record. The Spartans (1-1) shot 51 percent from the field, but were outrebounded 46-34 by the long and athletic Blue Devils. They also struggled at times with Duke's 2-3 zone. "Never in a million years did I think we would get outrebounded like that," coach Tom Izzo said. "We just got killed on the rebounds and that's unacceptable for a team with our size," Bridges said. "His eye was starting to shut," Krzyzewski said. "At first he had a hard time seeing out of the eye. It's scratched. I think he'll be fine." Michigan State: Izzo was frustrated by the rebounding deficit and Michigan State's 17 turnovers, but the Spartans looked every bit of their lofty ranking. Duke: Trent was just 3 for 14 from the field, but his late 3 was a key moment. "I'm proud of him," Krzyzewski said. "A lot of guys wouldn't shoot it. He just knocked it down."